Make an impression with a jewelry presentation cases. Enclose a special occasion jewelry gift in a wooden jewelry gift box. Perfect for giving an engagement ring or diamond earrings in a distinctive wood gift case. Enclose extra special jewelry in a presentation gift box. Choose a category above and shop individual wood gift boxes for the presentation of necklaces, rings, pendants & more. 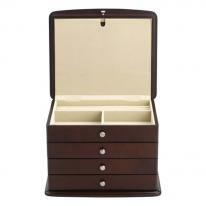 Our jewelry gift boxes are crafted of fine woods and feature luxurious linings. Styled for a variety of jewelry pieces from double ring sets to glamorous omega necklaces, our jewelry gift boxes add a special touch to any jewel gifts and provide a safe place to store fine jewelry too!